Thank you for visiting the Frank & Kraft, Attorneys at Law website. Our website exists for informational purposes only and is not intended to be advertising, solicitation or legal advice. Despite our attempts to keep information on our web site current, the contents may not reflect the most recent legal changes. Moreover, given the complexity of estate planning, not all generalities may apply to your current situation. Your receipt or transmission of information does not create an attorney-client relationship and cannot substitute for obtaining legal advice from an attorney admitted to practice law in your State. Should you choose to contact an attorney at Frank & Kraft, Attorneys at Law (via e-mail or other means of communication), do not disclose information you consider to be confidential. Unless otherwise agreed in advance, all unsolicited inquiries or information received by Frank & Kraft, Attorneys at Law will not be regarded as confidential. Some of the materials on this website contain links to other sources on the Internet. Such links are provided as citations and aids, and are not intended to be referrals or endorsements by Frank & Kraft, Attorneys at Law. Materials on this website may only be reproduced in their entirety, without modification, for the individual reader’s personal and/or educational uses and must include this Disclaimer and Notice. 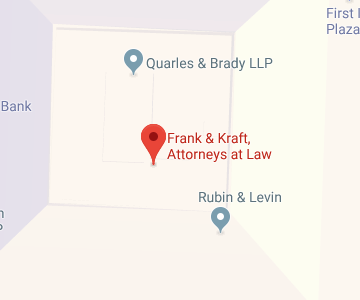 This Company is Frank & Kraft, Attorneys at Law in Indianapolis, IN.